The inspiration for this recipe came from ‘Polpo’ a recipe book by Russell Norman. Pork belly is very easy to cook and it’s always delicious. The bitterness of the radicchio and the pepperiness of the watercress work as counters to the richness of the pork. Preheat your oven to 240°C. If the skin of the pork belly hasn’t already been scored, do it with a sharp knife. Make sure the skin is dry and rub it with salt. Put the onion slices into a baking dish and place the pork on top. Pour in most of the cider making sure none gets on the skin. Place the dish in the oven. Bake for about 20-25 minutes then turn the oven down to 160°C. Cook for another hour or hour and a half. Add a little more cider if it has evaporated. If the skin doesn’t feel hard and crackly place the pork under the grill for the last few minutes. Remove from the oven and let the pork sit for 5-20 minutes. Wash and dry the radicchio leaves and watercress. Place in a bowl. Spoon some of the cider and pork juices from the baking dish and toss through the radicchio and watercress with a little olive oil to coat the leaves. Also mix in the chopped hazelnuts. 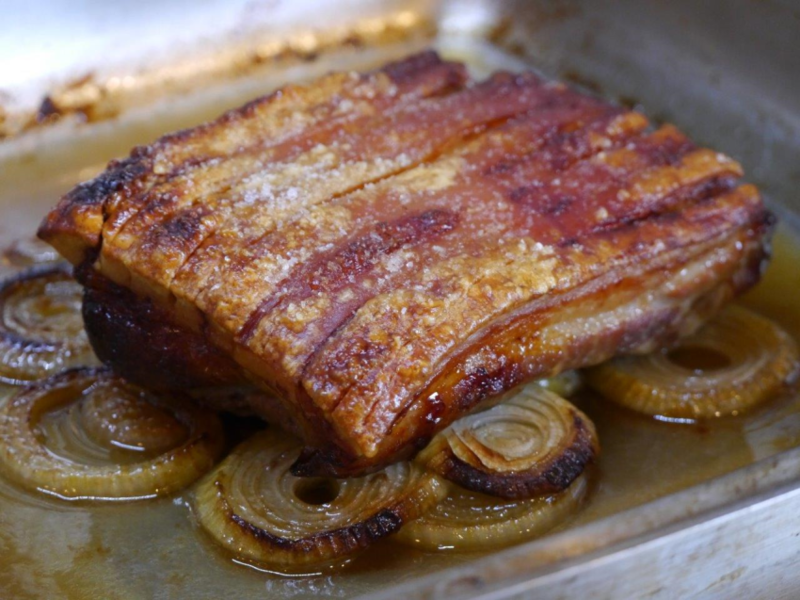 To serve, remove the crackling from the pork belly and break it into pieces. Slice the pork. 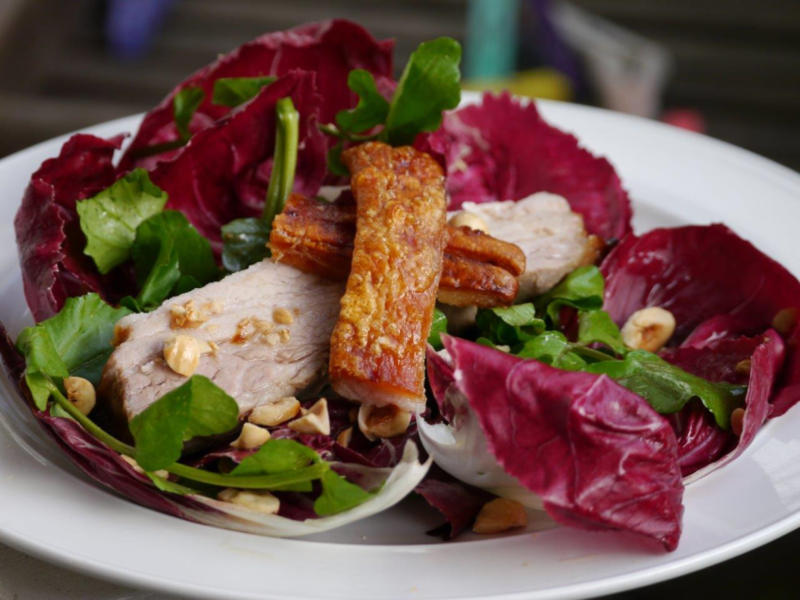 Place salad on individual plates and top with pork slices and pieces of crackling.